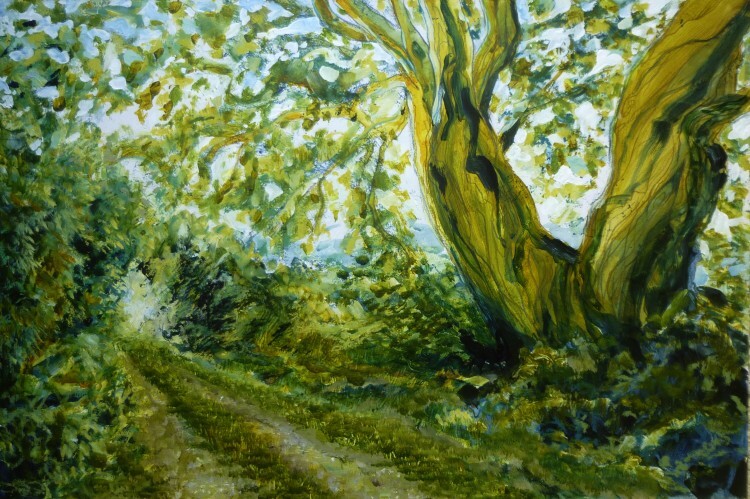 So, here’s the third painting from the Peddars Way walks that my sister and I undertook in September – a huge hornbeam tree by the track. We didn’t actually know it was hornbeam, but took a few leaves and tried to remember the colour of the bark and form of the tree, and looked it up when we got back to her house. This one was a bit experimental, starting with pencil crayons, then acrylic washes, then oil pastel – it was a lot of fun to do! All the details on the Gallery 2015 page as usual. I’ve been making up the new batch of Christmas card packs this afternoon. I only had one pack left after my last ARTSTUFF stall – now I’m restocked ready for the next one on the first Saturday of December. Later edit: December 8th: I have actually deleted this painting from the 2015 Gallery, as after consideration, I didn’t think it worked well enough, and didn’t really fit into the series.